What can PandoraStar be used for? Pandora Star guides you through self-created hallucinogenic imagery, “personal art”, of indescribable patterns and beauty, creating a deep sense of oneness and joy. Normal waking consciousness is predominantly beta waves, between 13-36Hz, with activation of alpha (during periods of relaxation), theta (during meditation or isolation chamber float sessions), gamma and delta. PandoraStar helps guied your brain between Alpha, Theta and Gamma waves. 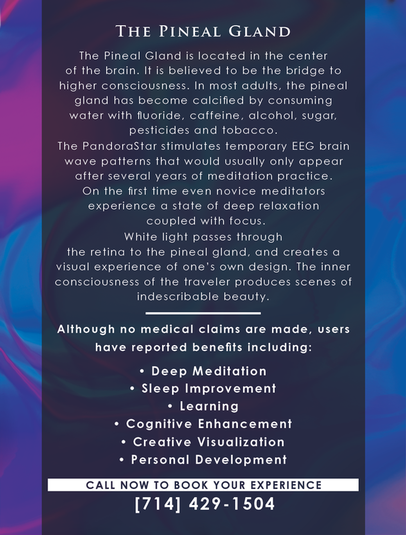 PandoraStar is used privately and commercially throughout the world by brainwave enthusiasts, biofeedback technicians, consciousness researchers, personal development trainers, holistic and metaphysical practitioners, spiritual retreats, and curious explorers. What is the Pandora Star Light Machine? A powerful light entrainment device, PandoraStar uses flickering light to guide your brain to experience a range of beneficial states of brainwave activity, which can then be used for the purpose of healing your body, balancing your emotions, training your brain and expanding your mind. The Pineal Gland is located in the center of the brain. It is believed to be the bridge to higher consciousness and is also known as the Third Eye. In most adults, the pineal gland has become calcified by consuming water with fluoride, caffeine, alcohol, sugar, pesticides and tobacco. One of the roles of the pineal gland is to detect white light through closed eyes. ​Light is receive by the pineal gland, which is responsible for regulating sleep patterns and is believed to release DMT at birth, death, during childbirth and in ceremonies such as Ayahuasca. DMT is in integral part of our dreams, birth, death, psychic and visionary experiences. The PandoraStar stimulates temporary EEG brain wave patterns that would usually only appear after several years of meditation practice. For the first time even novice meditators experience a state of deep relaxation coupled with focus, where one is in touch with their own intuition and sense of wholeness. White light passes through the retina to the pineal gland, and creates a visual experience of one’s own design. The inner consciousness of the traveler produces scenes of indescribable beauty. Through a sequencing and control of flickering light, PandoraStar makes it possible to access any frequency state from .1 HZ to 200 HZ, creating unprecedented brainwave entertainment possibilities. Using a unique inverted triangle array of LED lights that interlock to create a series of hexagrams, PandoraStar stimulates various brain regions by focusing rays of light on the retinas. Through closed eyelids, users experience a “visible” frequency of entertainment of kaleidoscopic patterns of colors and psychedelic imagery, which provides an immersive environment for deep level brainwave entrainment. *It contains a stroboscopic stimulus that should only ever be observed through closed eyelids. *Epileptic seizures can be triggered with photosensitive persons. *It claims no medical effect whatsoever and is not intended for the diagnosis of illness or other disorders. *It is not intended for treatment, relief, healing or prevention of disease, nor is it intended to influence body structures. *In case you have ever had any kind of seizure or epilepsy. *In case you have ever had a severe head injury or concussion. *If you are taking any medication. *If you sufer from heart or other health troubles which require medical treatment. Do not use the device if you have a cardiac pacemaker.